Our friend Julie Brettell was diagnosed with breast cancer at the age of 37. She gave up her demanding job and quickly underwent surgery, chemotherapy and radiotherapyJulie, like the majority of women, still wanted to look her best despite her illness, but struggled to find clothing, wigs and skincare products which were of high quality and sold in a pleasant environment. We (friends Lisa and Paula) and Julie found the task of searching out the items we did manage to find to be an exhausting and frustrating one. We made the decision that, once Julie was well enough, we would do something to help other women in a similar position. Julie returned to work and in April 2013 received confirmation from her surgeon that she had now achieved her 5 years’ “all clear” status. At this point we started detailed research and this lead to the formation of Embrace which is now run by us. 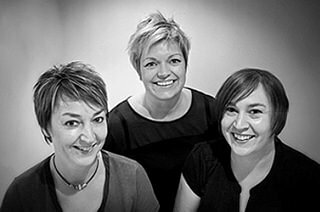 Embrace is an exclusive boutique offering a specialist service and support to women affected by cancer, to women undergoing chemotherapy and radiotherapy, to women experiencing hair loss and to their partners, friends and relatives. We believe that women affected by cancer and alopecia are getting a raw deal from mainstream retailers. Our mission is to make things better for you. We have many high quality, luxury products, all available from our comfortable and stylish “one stop” boutique. We aim to give our customers an individual service and to offer support and useful advice. You should be able to purchase the products you need easily – without making multiple trips or doing hours of research on the internet. You should be able to browse through a wide range of quality products – not just the couple of token mastectomy bras at the back of your local high street department store. You should have the opportunity to try on and compare items before buying if you wish to do so – rather than having to guess what will suit you from a picture in a brochure or on the internet. You should be served by staff who are well trained in fitting, knowledgeable about their products and sensitive to your needs. And you should be able to do all of this in a comfortable and discreet environment – not at an industrial unit or a pokey corner at the back of a hairdressing supplier. Our internet shop will make our products available to those ladies who are not able to attend in person and we will be available to provide assistance by telephone or email where needed. We appreciate that the partners, family and friends of the women we serve, often find it difficult to find suitable gifts for their loved ones. Our boutique and website therefore contain many items which have been hand-picked by us as ideal for this purpose. We believe that cancer, chemo and alopecia are issues that we should not shy away from and that we can show our support to our loved ones with a specially selected gift. We also believe that Embrace must “give something back” to the community it serves – so we will be contributing a percentage of our profits to local charities which support the interests of our customers. We are currently supporting the Worcestershire Breast Unit Campaign to set up a dedicated unit for those affected by breast cancer in the county and we have participated in events, donated and funded advertising to assist the campaign. We have also partnered with Birmingham based charity Ladies Fighting Breast Cancer and are part of their patients lounge in central Birmingham.